CUTE CUTE CUTE! great job on the logo especially! Awe! I love this mani! Peeps! We peep joust every year. Once we found the Target exclusive red peeps, which look super evil! Another time we used Will's Tea Tree Oil toothpicks. Don't ever use flavored toothpicks! It caused eye-watering fumes, running everyone out of the kitchen. omg this is super cute!!! I love it!!!!! Awesome!! I think this was the first year that I actually didn't eat any Peeps on Easter...they make a much better nail design! I love Peeps and I was just eating some... I have a serious thing for marshmellows! This is so cute and as always, an amazingly good job!! LOVE!! This is really cute! It actually reminded me of Kenny from Southpark! Very cute! I love all of your work. I do have a nail question that I hope you can answer. My nails recently went nutz and are spiltting like crazy. What base coat would you reccommend I use to help with the splitting and weak nails? I've used Nail Magic in the past, but recently found out that it's not a safe polish to use. I would appreciate any help you can give me with this. Thank you sharing your work with us! lol agree with rins! I thought it looked like a yellow kenny! So cute! Your designs always impress me! Yesterdog? Are you in Grand Rapids? These are very cute xD The logo on the thumbnail looks awesome! haha i loove this!!! and i dont even like peeps! 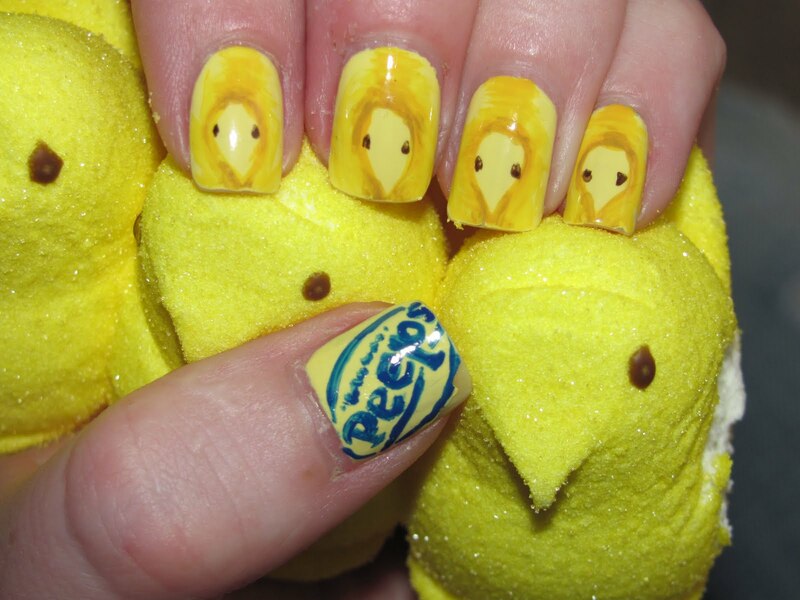 I used to nail a Peep to my front door every Easter. Peeps! All of us research joust each and every year. Even as found the mark exceptional crimson peeps, which usually search excellent unpleasant! Yet another time most people applied Will's Tea leaf Shrub Gas toothpicks. Really don't ever use distinctive flavored toothpicks! Them brought about vision-watering gases, jogging everyone out of your your kitchen. It sounds like something good to eat. I really like grilled prepared sandwich.